Potawatomi Chief Simon Pokagon was born in 1830 in Berrien County, Michigan to Leopold and Elizabeth (Ketesse) Topinabee Pokagon. Usually, success after following a great parent, like Chief Leopold Pokagon is extraordinary, but Simon achieved it. Simon built off of his father’s wisdom and accomplishments to complete Leopold’s vision for the future of his tribe. Simon was 10 years old when Leopold died. Simon’s mother realized the importance of education. At the age of 14 Simon was sent to the new school at Notre Dame. Three years later he attended Oberlin College in Ohio. Simon spoke five languages. This education laid the foundation for Simon’s success in bringing his tribe into the 20th century and to thrive in white man’s world. Leopold sold his tribe’s ancestral land to the U. S. at 3 cents per acre, however payments were slow coming and his tribe was suffering. Simon learned the ways of a diplomat. Twice Simon met with Lincoln over late payments. Simon later wrote: “I went to see the greatest and best chief ever known, Abraham Lincoln. I was the first Red Man to shake hands and visit him after his inauguration.” Near the end of the Civil War Pokagon finally received $390,000 toward what was owed. After the war Simon met with President Grant. Expecting to meet fierce warrior he found Grant to be kind and respectful. It was at the 1893 Columbian Exposition that Simon really shined. 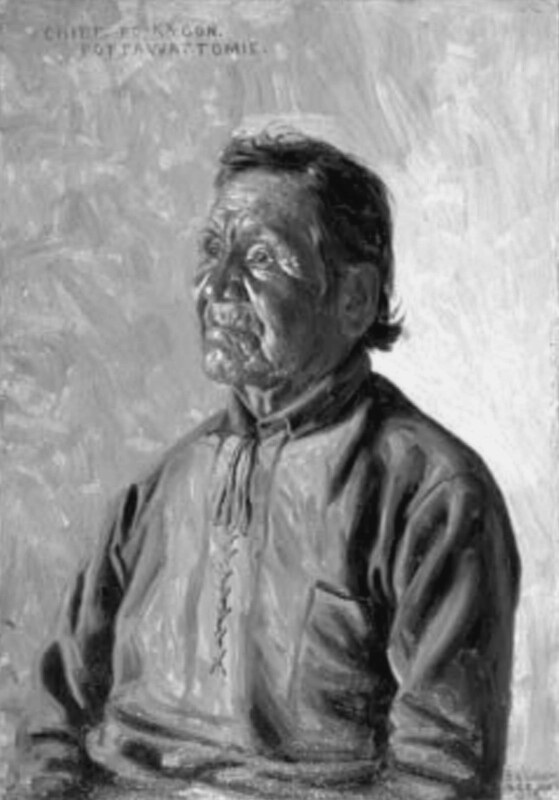 Upset that no Native-Americans were invited to represent their people Simon responded with writing “The Red Man’s Rebuke.” It was printed on birch bark and read worldwide. In his 16 page book Pokagon lays out the Indian’s views on the white man’s conquest of their land. The book is a scathing attack and did not mince words. He described how the white men were initially viewed as parasites but became as locust and gobbled up their land. Pokagon made such a gripping argument that the mayor of Chicago asked Pokagon to be the keynote speaker of the exposition. The book can still be found online. Another famous book Pokagon wrote was “Queen of the Woods.” In this book Pokagon describes his courtship of his wife. Pokagon describe the land of his youth, but the underlying theme is to rid his land of the corruption of “firewater.” It too was published on birch bark. Pokagon is best described as the “Red Man’s Longfellow.” Simon Pokagon died on January 28, 1899 He is buried in the Rush Lake Indian Cemetery in Hartford, Michigan.